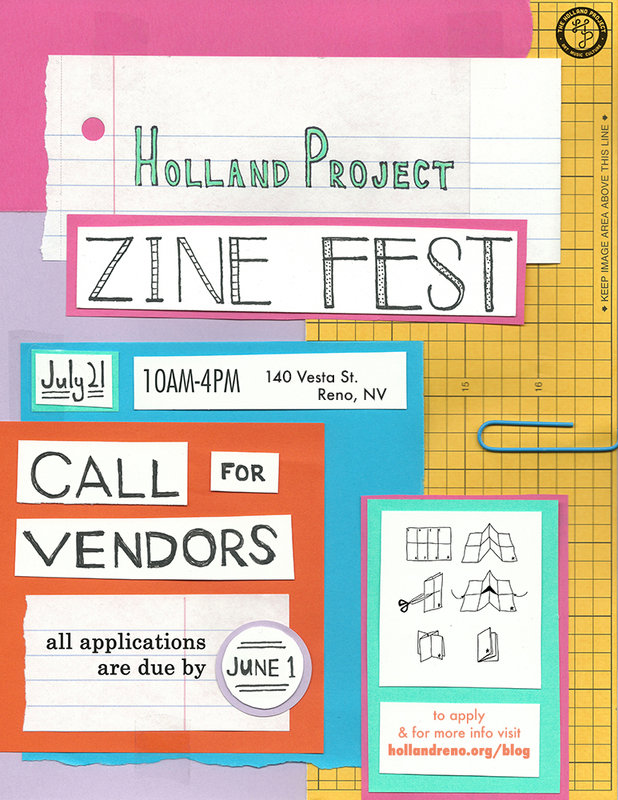 We are stoked to announce the very first Holland Project Zine Fest! This will be fun opportunity for zine lovers and makers from near and far to come together, hang out and buy/sell/trade/share zines. The event will take place Saturday, July 21st, 2018 from 10am-4pm at the Holland Project, located at 140 Vesta St., Reno, NV. We are currently seeking zine vendors to table at HP Zine Fest!! Vendor applications are open from April 1st – June 1st and we’ll have half tables (3 feet) available for $20 or full tables (6 feet) for $40. We ask that only distros or vendors with 10 or more zines/independently made publications apply for a full table. If the table fee presents a hardship for you let us know! We are certainly willing to work with zine makers and want this event to be as accessible as possible!! There is limited space so be sure to apply asap. Depending on the amount of applications we receive, the event will be lightly curated by a small selection committee. Stay tuned for more details and fun zine themed workshops and events leading up to the main event! Click here for the Vendor Application Form! !